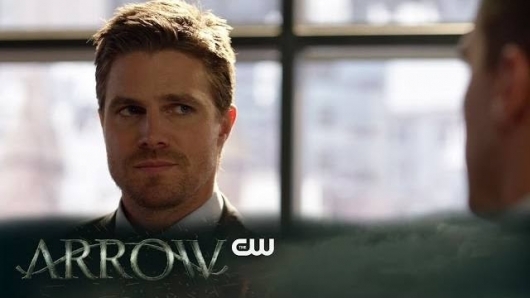 Last time on Arrow, because of the psychological and physical torture Adrian Chase (Josh Segarra) subjected him to, Oliver (Stephen Amell) decided to disband the team, and also officially ended things with Susan (Carly Pope). He called in the Bratva to handle Chase, who ran around taunting him. The team was aghast and fought the Bratva because the deal let them take medicine. Oliver came to his senses, but Anatoly (David Nykl) declared war. 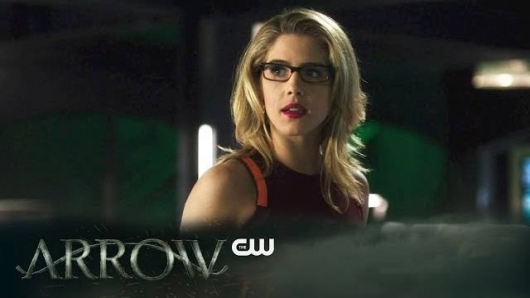 Felicity (Emily Bett Rickards) and the Helix outed Chase, who killed his protective guard and escaped with a smile. 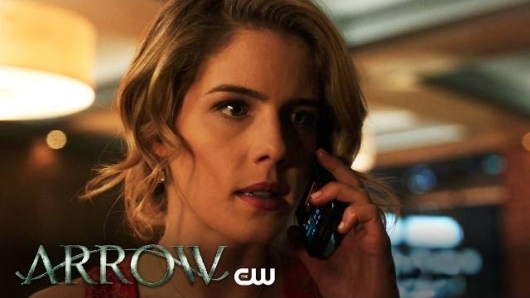 Last week on Arrow, Felicity (Emily Bett Rickards) finally finds Ray (Brandon Routh)! Except that he is really tiny and being held captive in a teeny glass box by Damian Darhk (Neal McDonough). There’s an elaborate rescue plan (isn’t there always? 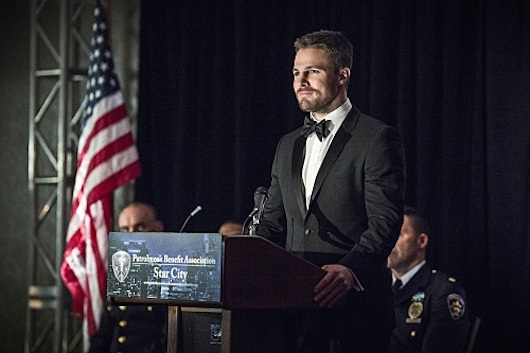 ), helped tremendously by Lance (Paul Blackthorne), which involves Oliver’s captivity. 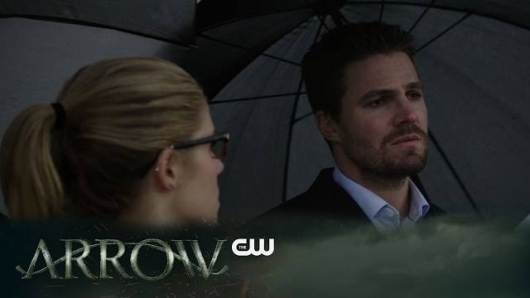 Hopefully, getting Ray back will help Oliver (Stephen Amell) and Felicity get back on track. Although it was fun watching Diggle (David Ramsey) and Oliver bond over whisky and relationships. Felicity’s mom (guest star Charlotte Ross) shows up, and of course that drives Ms. Smoak cuckoo. Sara (Caity Lotz) leaves town. Last week’s Arrow ended so creepy, with Laurel (Katie Cassidy) digging up her sister (corpse played by Caity Lotz), while Thea (Willa Holland) nervously looked on. The reason for the digging? Well actually, Laurel wanted to help Thea find out exactly what was going on with her crazy Lazarus Pit after-effects. She set someone on fire. Luckily, he didn’t die. Unluckily, he turned into Anarky (Alexander Calvert). No wonder everone is worried about her. An old family friend, Jessica Danforth (Jeri Ryan), decides to run for mayor of Star City. It would have been quicker to put a bullseye on her back. H.I.V.E. tries to kill her, then kidnaps her daughter. 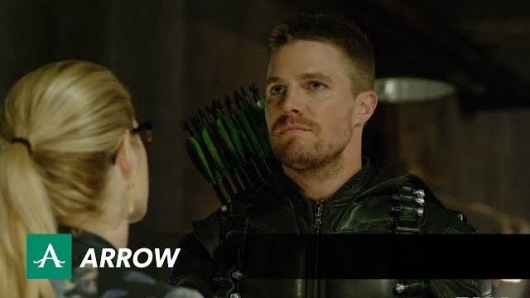 Oliver (Stephen Amell) tells Felicity (Emily Bett Rickards) that he will run for mayor, inspired by Lance (Paul Blackthorne) and Jessica. Felicity has to downsize at Palmer Tech, but figures out how to not do that, saving her new future sidekick, Curtis Holt (Echo Kellum).